The fate of the honey bee is in question, as the decline in the honey bee population has been noted by scientists and brought to the public’s attention by filmmakers. The honey bee serves many important functions in our eco-system, including pollinating plants so that they might produce food for us to eat. This is one reason why it makes sense to help the honey bee thrive. In order to keep the honey bee population strong, there has to be an abundance of plants around that will give them pollen and nectar they need. And, these plants must not be heavily sprayed with pesticides, because these chemicals are detrimental to the bee. 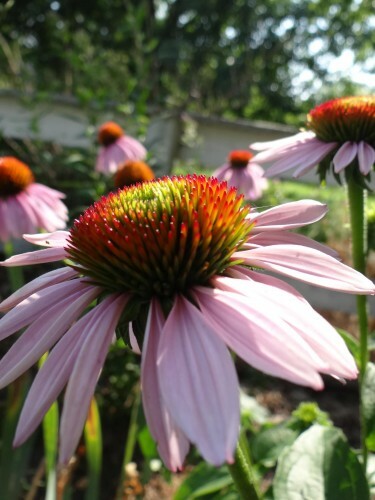 The pale purple coneflower is a beautiful flower with delicate drooping petals. It’s a favorite of the honey bee, and when in full bloom it actually attracts tons of bees to a garden. The pale purple coneflower even brings in butterflies, so choose this flower and enjoy a show for up to three weeks, from June to July. Common yarrow produces bright, flat heads of tiny daisy-like flowers. Honey bees really love this plant. It’s native to Eurasia and North America, but no matter where it’s planted, it’s sure to be accompanied by tons of pollinators. Common yarrow comes in a stunning “Strawberry Seduction” variety and a beautiful “Wonderful Wampee” version. As you plan for these bee-loving flowers in your garden, keep their placement in mind. While these flowers are wonderful for bees, they’re not the best to have next to where kids might play. These flowers for honeybees can be planted strategically to offer nourishment and beauty, without causing problems. The fate of the honey bee is in question, as the decline in the honey bee population has been noted by scientists and brought to the public’s attention by filmmakers. The honey bee serves many important functions in our eco-system, including pollinating plants so that they might produce food for us to eat. This is one reason why it makes sense to help the honey bee thrive.In order to keep the honey bee population strong, there has to be an abundance of plants around that will give them pollen and nectar they need. And, these plants must not be heavily sprayed with pesticides, because these chemicals are detrimental to the bee.